Many people and scientists around the world are focusing on carbon dioxide as the most responsible factor for global change, specifically global climate change. Yet, the steady rise in manufacturing and release of synthetic chemicals into our environment is not being properly analyzed. The ecological effects of pharmaceuticals, pesticides and industrial chemicals is severely lacking in research, according to a new study in Frontiers in Ecology and the Environment. sourceAccording to the co-author Emma J. Rosi, ecologist from the Cary Institute, global change assessments are ignoring synthetic chemical pollution despite the increasing rate of use is more rapid than other agents of global change, like CO2 emissions or nutrient pollution. For something to be considered an agent of global change, it needs to meet the criteria set out by the Millennium Ecosystem Assessment. It needs to be 1) globally distributed, 2) have an increase in relation to human populations and economic growth, and 3) also have known impacts on biological diversity and organisms. Despite synthetic chemicals matching this criteria, the overall scientific community has been ignoring a proper assessment of their impact. 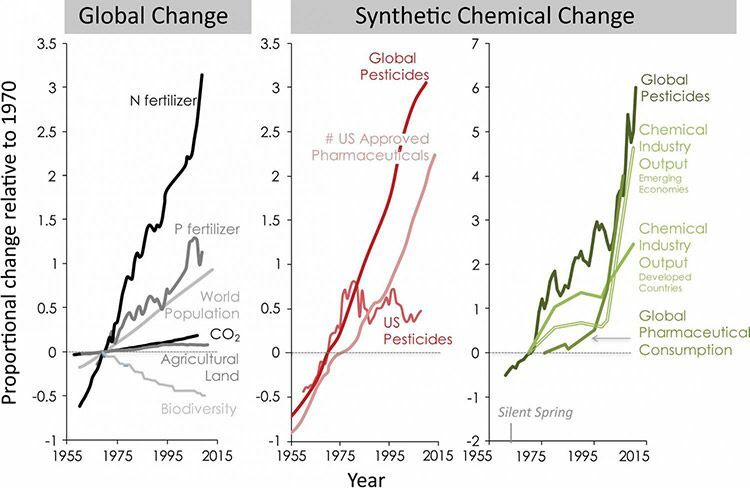 The study looked at synthetic chemical pollution since the 1970s and compared the results to other factors that drive global change. Out of all the leading ecological journals, ecological meetings and presentations, and Natural Science Foundation grants for research, less than 1% of journal articles, 1.3% of presentations and 0.01% of grants have been used to explore the ecological effect of these chemicals. 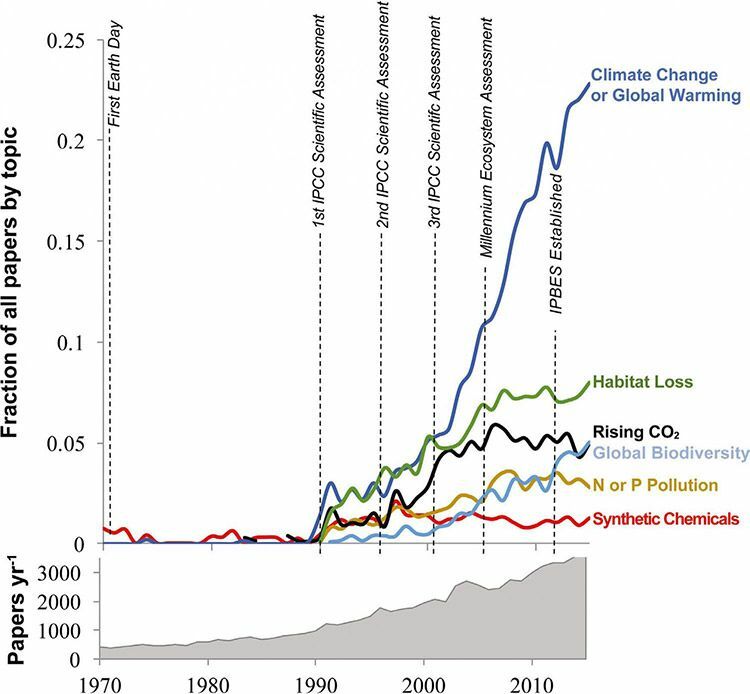 Total publications and the proportion of published papersLook at that chart above, there is a crazy difference in the amount of papers about Climate Change compared to synthetic chemicals. Synthetic products, such as pesticides, pharmaceuticals and industrial chemicals do leave long-term toxic effects that ripple through different layers of our ecosystem. Lab research does not equate to what happens in nature. There is a bioaccumulation indifferent food webs. As various chemicals seep through different layers of our environment they also mix with other chemicals to form reactions are even more toxic. The chemicals can also be affected by sunlight or even processes of natural chemical releases from organisms in nature. I have talked about this in my work on psychology, the importance of knowing the consequences to our actions before we foolishly engage in them (not that we can always avoid it). Humanity has been engaging in the same foolish behavior, where we arrogantly create things and start using them without understanding the consequences and deleterious effects that such creations can potentially bring. We seem to create whatever we want to get the result we desire, and then ignore a proper evaluation of what this will do in the long term. Humanity has long been focused on short-term gains. We are not properly evaluating our behavior as individuals, nor our behavior in the aggregate as a species. 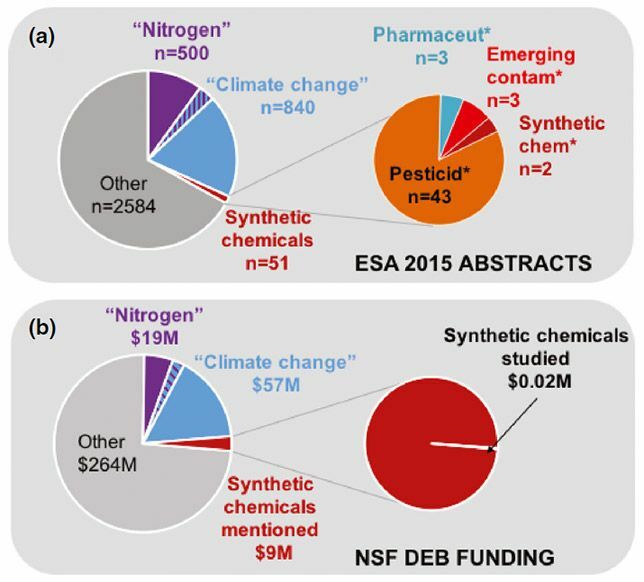 The primary funding agency for ecological research in the United States is the National Science Foundation, and they are not supporting ecological research into synthetic chemicals. Neither are other US governmental agencies and private foundations that used to fund long-term research, due to having their budgets cut or redirecting their funding to human health and lab-based studies that don’t evaluate the reality of the chemical interactions in the complexity of nature. Studying things isolated in the lab will only get you so far. The problem of synthetic chemicals and their dangers on the environment and our own health, has been an issue that has been brought up since the 1960s, yet it hasn’t been taken seriously enough. The “global warming” meme started in the 80’s, leading up to where we are now, while ignoring other factors that play a part in climate change. “Global warming” was dropped in the latter part of the first decade of this millennium, and substituted with climate change, but the CO2 focus and blame squarely on humans hasn’t changed. Personally, I have posted comments remarking on the dangers of chemicals, and other things that humans have not properly evaluated the consequences to these new modifications, such as genetically modified organisms. Yet when I, or other people, mention the obviousness of the dangers of chemicals and how we are poisoning ourselves, some people want to make fallacious remarks about how chemicals are in everything, therefore in their minds, there’s nothing wrong with synthetic chemicals made by humans. There is this hyper-skepticism that seems to pervade society and prevent people from recognizing the obviousness of problems in reality that we are creating. Ignorance is bliss for some.